In this broken world, community is rare. Sadly, this is sometimes true even in the church. Conflict confronts us in just about every corner of our lives — from personal to familial, from congregational to denominational, from national to international. "We desire community but so often react out of brokenness," writes one reviewer, "Conflict and Communion points to the Lord's Table as the place where true harmony can be experienced." Porter sets the stage for the book by naming the conflicts that were present at the Last Supper — conflicts among the disciples, conflicts among those in authority. Then as now, the Eucharist and its spiritual power propels much-needed transformation in individuals and in congregations to heal our greatest needs. The 10 essays, written by a diverse group of church leaders, reflect on practical ways to live the sacrament in the everyday and extraordinary life of congregations. 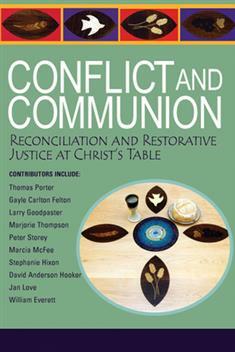 Reclaim the radical restorative justice and interdependent community available through the Table of Holy Communion. As the editor writes, "Through the practice of reconciliation empowered by the liturgy of Holy Communion, we hope that the Table will become for all of us and for our world a source of healing, transformed life, reconciled relationships, with God and with one another."